is a professional musician and a certified teacher of the Alexander Technique (Alexander Technique International, January 2000). He has studied the Alexander Technique with many master teachers including Barbara Conable (Portland, OR), Christine Hardy (Paris, France), Marie-Françoise Le Foll (Paris, France), Tommy Thompson (Cambridge, MA), Anne Waxman (New York, NY) and with Don Zuckerman in Breathing Facilitation work (Washington, D.C.). He has completed post-grad courses with John Nicholls (NYC, The Carrington Way of Working) and with Barbara Kent (NYC, Progress Not Perfection). Most recently, David has done advanced work with Elizabeth Walker and Yehuda Kuperman. 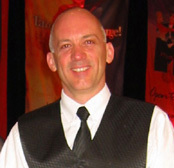 David has a private teaching practice in Columbus, Ohio and is on the faculty at Denison University. As a teacher of the Alexander Technique and Body Mapping, he works with a diversity of students including, but not limited to, musicians, actors, dancers, athletes, computer users, artists, and pregnant women. Arlington, Massachusetts, (Boston area musicians). Atlanta, Georgia, (Workshops sponsored by the Atlanta Symphony & Franklin Pond Chamber Music). Bowling Green State University, (string players). Music in Healing and Transition Program Conferences, Cleveland, Ohio; Portland, Oregon. Norfolk, Virginia, (musicians of the Virginia Symphony). You and Music Program, Schoolhouse Retreat & Cultural Center, Talent, Oregon. As a musician, David performs with the Collegial Brass, the Cathedral Brass Ensemble, the New Hampshire Music Festival, and the West Virginia Symphony. He served for 10 years as Principal horn of the Cleveland Chamber Symphony, an ensemble specialized in the presentation and recording of new American music. Previous festival affiliations include The Lancaster Festival (Ohio) and the Shenandoah Valley Bach Festival (Virginia). He is an alumnus of Capital University (B.M.) and Indiana University (M.M.). His primary horn teachers were Nicholas Perrini, Philip Farkas and Frøydis Ree Wekre. David enjoys salsa/mambo dancing, hiking, backpacking, and yoga.